Several hundred people attended a hearing in Ham Lake Tuesday night to speak out against a proposed Anoka County sales tax increase that would build a new stadium for the Minnesota Vikings. The chair of the Minnesota House Taxes Committee held the hearing to gauge public support for both the proposed tax and a referendum on the plan. Officials with the Vikings and Anoka County say a referendum is not needed. Ham Lake, Minn. — About 500 people attended the standing-room-only hearing at the Majestic Oaks Golf Club in Ham Lake, and it was obvious from the crowd's reaction that many didn't like the sales tax proposal. The Vikings and the Anoka County Board agreed in September on a $790 million stadium proposal that relies on county, state and private money. Vikings owner Zygi Wilf has pledged $280 million of his own money for the project. Most of those who testified at the hearing spoke against the three-quarters of 1 percent countywide sales tax increase that's a linchpin the stadium proposal. Burt Hanson of Anoka said he lives on $1,200 a month and is worried that he can't afford any other tax increases. "You folks are asking the average citizens to give you money that we don't have. You people don't realize how dependent you are on the little people. I would be ashamed to say that I denied all of these people the right to vote," Hanson said to applause from the audience. Officials with Anoka County and the Vikings have argued against a public vote on the tax hike. They contend it isn't needed because elected officials on the state and county level will vote on the proposal. They say those officials were elected to make such tough decisions. Anoka County Commissioner Margaret Langfeld says she understands that many people are upset about the tax, but emphasizes that if it's approved, $1 billion worth of development will occur in the area. "People generally don't jump and down and get excited about taxing themselves, and I don't know if our people are any different. I don't think it's the best way to do it, but we're willing to because we see the return on investment," said Langfeld. Langfeld says thousands of short-term and long-term jobs would be created if the stadium is approved. She also says the proposal would ease traffic congestion, since the stadium plan requires the state to speed up road improvements at a cost of $115 million. Langfeld says the entire project would boost property values and the county's quality of life. Those comments upset Blaine resident Tom Jablonski. His voice shook as he spoke out against the project. Quality of life is not football. I've heard that said so many times and it makes me sick. "Quality of life is not football. I've heard that said so many times and it makes me sick," said Jablonski. "Do people not see what's going on in the world today? This is our priority -- to build a football stadium?" About two dozen state lawmakers attended the hearing. Many sat quietly and listened to the four hours of testimony. Others, like Rep. Chris DeLaForest, R-Andover, voiced their opposition to the proposal right from the start. "Regardless of the rest of the testimony that I will hear this evening or anywhere else in the Taxes Committee, rest assured to the people who live in Ham Lake, there will be a referendum on the stadium bill if I have anything to say about it," said DeLaForest. DeLaForest says state law requires voter approval for any local sales tax increase. But supporters of the stadium proposal say other major projects like the Mall of America and the Xcel Energy Center didn't require a referendum. Others in favor of the Vikings' plan say taxpayers should help the team pay for a stadium. Larry Spooner of Plymouth was dressed in a Vikings shirt, a Vikings hat and Vikings socks. 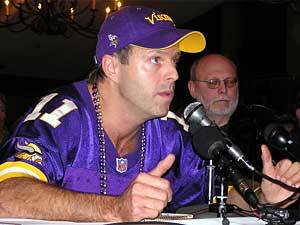 He said television ratings for Vikings games show state support for the team. "The people who use the stadium should pay for the stadium," said Spooner. "That includes 70 percent of the households that have the television on with their four buddies over watching the game for free." The committee took no action at the hearing. And it's unlikely that any action will take place soon, since state lawmakers are signaling that they have little appetite to address the stadium needs of the Vikings, the Twins or the University of Minnesota in a special session.